HARRISONBURG — Legislation filed this week outlines where lawmakers will begin their deliberations on proposed tolls for Interstate 81. On Tuesday, state Sens. Mark Obenshain, R- Rockingham, and Bill Carrico, R-Grayson, introduced a bill that would fund improvements to the heavily traveled interstate. Del. Steve Landes, R-Weyers Cave, filed companion legislation in the House on Wednesday. 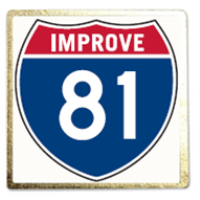 “This is a starting point,” Landes said.The proposal comes after a yearlong study of ways to improve I-81 and how to pay for them. The Commonwealth Transportation Board, which conducted the study, concluded its work with a list of recommendations to bring needed improvements to the heavily traveled corridor, which runs 325 miles in Virginia from the West Virginia border in the north to Tennessee in the south. Recommendations range from widening the interstate in certain locations, including Harrisonburg, to adding truck-climbing lanes. Funds generated by tolls could only be used for projects identified in the study, which come with an estimated $2.2 billion price tag. The bill details how tolls will be collected and prices, how the funds generated will be used, and exemptions for local travel. It is referred to as SB1716 in the Senate and HB2718 in the House. Toll rates in the bill are limited to 11 cents per mile for cars, while Class 6 and higher trucks will be charged no more than 17 cents per mile. Bridges will also have a toll, which stands at no more than $36.83 for cars and $55.25 for class 6 and higher trucks in a single direction. One provision would allow people who can show they can’t afford the tolls to receive an exemption for a daily waiver past one gantry. The bill, if ratified, would create a committee with 13 voting members. This includes the chairs of the five regional planning district commissions the interstate crosses; three members of the House and two from the Senate from those districts; three members from the Virginia Department of Transportation construction districts of Bristol, Salem and Staunton. The commissioner of highways and the commissioner of the Department of Rail and Public Transportation will be nonvoting members. A proposed source of revenue not included in the bill is a combination of regional sales and gas taxes. While those were used for projects in other areas of the state, Landes said they would not work for I-81. “They’re not dealing with 52 localities and 200- plus miles,” said Landes. In addition, Landes said “the burden would be on the local drivers,” rather than out-of-state drivers. Tolls would provide a dedicated revenue source, which would increase Virginia’s chances of securing federal funding for I-81 improvements. Projects on other interstates in Virginia, such as I-64 and I-95, have leveraged federal dollars by using dedicated funds, Landes said. The revenue would primarily be paid for by trucking businesses, said Obenshain. According to the bill, I-81 carries 42 percent of all truck traffic in Virginia, and trucks account for 20 to 30 percent of all traffic on I-81. Under the proposal, solutions would be developed to catch drivers dodging tolls. The legislation calls for bonds with a 40-year term, but Landes said the goal is to pay them off in 30 years. Tolling is not intended to continue “in perpetuity,” Landes said, but no end date has been set. Obenshain said he is open to suggestions of better ways to pay for improvements.